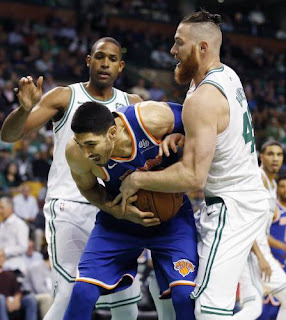 In the first half of Tuesday night’s rather easy triumph over New York, Brad Stevens’s Celtics drained 20 field goals (compared to the Knicks’ 15) and successfully concluded three other possessions (compared to the Knicks two) by drawing a shooting foul – and-1’s not included. That’s 23 conversions, compared to the Knicks’ 17. 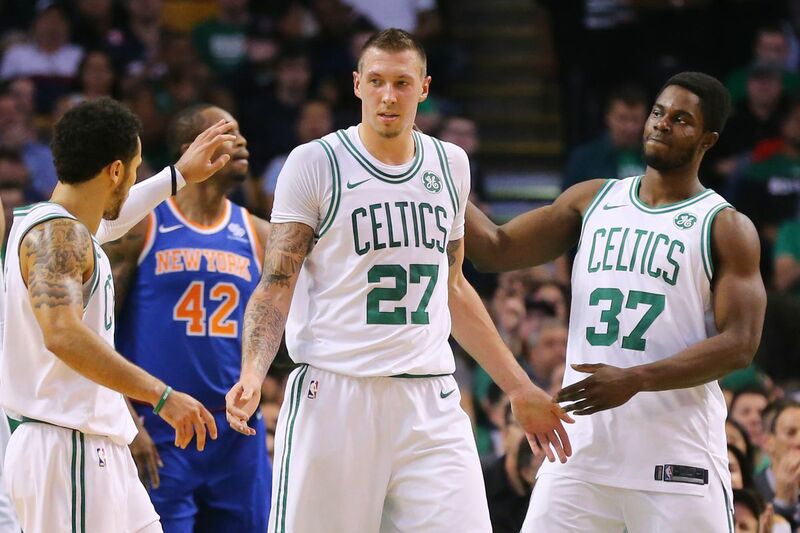 The C’s hit seven treys in that 24 minutes, while Jeff Hornacek’s crew missed all seven that they took – New York also missed three FT’s, compared to just one for Boston. Seven three-balls plus two fouls shots – that’s a swing of nine points … plus 12 points worth of possession … we ought to be ahead by 21, maybe 54 – 33? In point of fact, it was quite clear, from the mid-point of the second quarter that our boys were gonna have to really fall apart to make this one close. The Knicks did fashion a nice stretch of eight straight conversions – the game’s longest run – for 15 points in the middle of the third quarter. But with the help of a couple of their 14 three-pointers, the C’s scored 10 of their own and never seemed challenged. The Boston rebounding resurgence during the season’s first three games took the night off. Including Team Offensive Rebounds, the New Yorkers held a 15-7 advantage, good for a 15-6 edge in “follow-up” points. 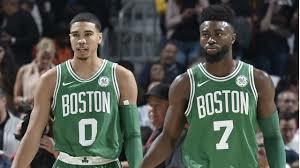 The Celtics best sequence was their close out to the first quarter – six straight conversions for a 14-5 run. Then they shut down their foes for the first six possessions of Q2 – counting the last two of Q1, NY recorded six misses, two turnovers and no OR’s in eight trips down the floor.